As Oxberry's Dramatic Biography and Histrionic Anecdotes puts it so picturesquely, Margaret Agnes Somerville was 'ushered into life' on October 26th, 1799, the eldest daughter of one, John Somerville, a biscuit baker from Lanarkshire. Theatricals were frowned upon by the stern Calvinists north of the Border, but the taboo merely created a mania for acting among young folk. Miss Somerville was no exception and she made her first appearance at the age of eleven, in a hayloft, playing Marcia in Addison's Cato. Despite a thick Scottish accent, she is said to have carried off the part with aplomb. 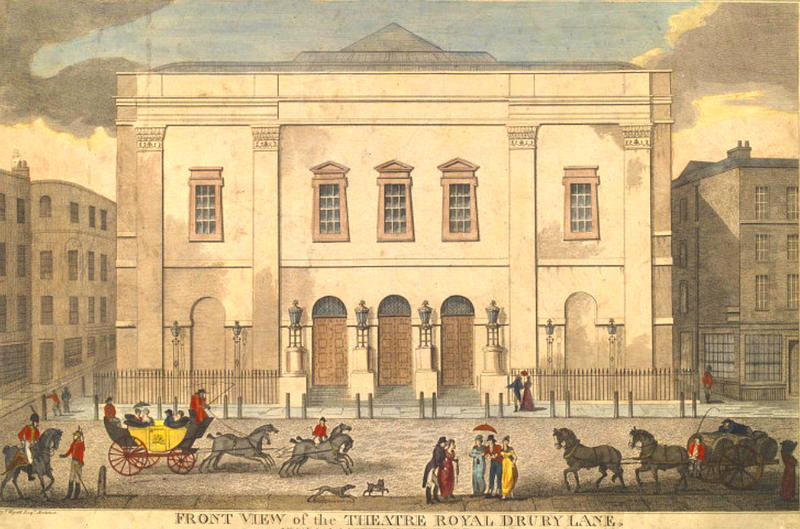 Soon afterwards, John Somerville moved his biscuit business to Marylebone and Margaret fell under the eye of Sir Douglas Kinnaird, a member of the sub-committee of the Drury Lane theatre. By then, she was sixteen. He agreed to audition her in the presence of John Kemble and neither thought she would do. But she had a champion in their friend, Sir George Hayter, the painter who had 'taken her likeness', and they were persuaded to give her another chance. This time, Lord Byron was watching from the pit and her renditions from Venice Preserved aroused his enthusiasm. At which point, Douglas Kinnaird discovered that his first judgement had been a little too hasty! 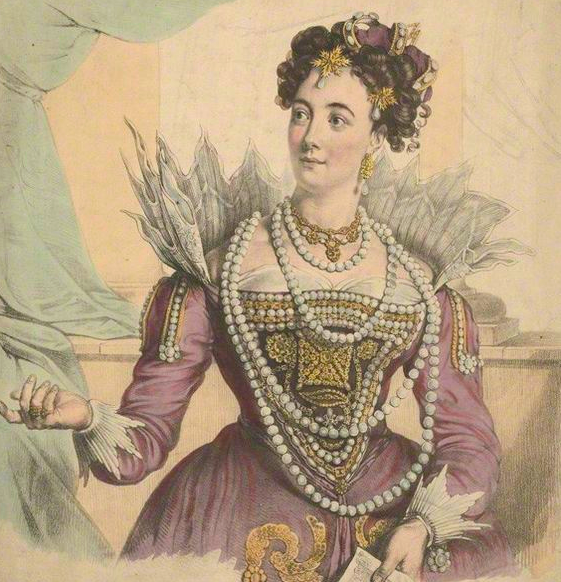 On May 9th,1816, Miss Somerville made her debut at the Theatre Royal, Drury Lane, as Imogine in Maturin's tragedy Bertram to riotous acclaim. Her career was assured and she went on to make roles such as Lady Macbeth, Alicia in Nicholas Rowe's Jane Shore and Bianca in Dean Milman's Fazio her own. Passion was her forte. 'The boiling of Etna, fierce, wild and uncontrollable' raved one critic. The management proposed that she co-star with Edmund Kean in a series of plays. All was fine until the actor stormed out of rehearsals because he felt his want of stature beside the heroine made him appear ridiculous. Miss Somerville was described as tall and rather masculine in form. 'Her face', says Oxberry 'is not beautiful but interesting and expressive'. Performances at Covent Garden, Bath and Cheltenham followed. At Birmingham, she was directed by Alfred Bunn who succumbed briefly to her stage magnetism and persuaded her to be his wife. Some accounts of Bunn's talents are rather disparaging, and he was certainly no manager of money, but almost every renowned thespian of that era played to his tune. He had scratched a living from his pen and later, in a bid to introduce English opera to audiences, became the librettist of the Irish composer, Michael Balfe, most notably of The Bohemian Girl, a work that recalls the beautiful bel canto style of Donizetti and Bellini. One of its most popular arias I Dreamt That I Dwelt In Marble Halls (latterly revived by Enya) has just that melodic and sentimental lyricism of musical evenings in the Victorian drawing room. It was at Cheltenham that Mrs Bunn encountered Colonel William Berkeley, eldest son of the 5th Earl of Berkeley and Mary Cole, his Countess. 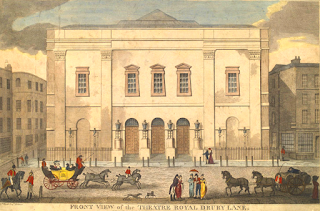 He and Byron were bosom comrades and the two of them were regularly seen at the town's Theatre Royal where the Colonel managed the company and performed his favourite roles. 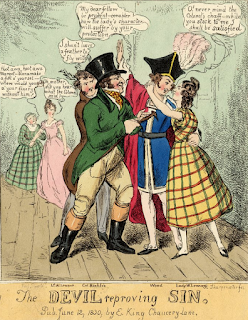 Though a man of many talents, he was the archetypal 'cad and bounder', disappointed in his inheritance and the aristocracy in general, and at loggerheads with his devoted mother who, prior to his birth, had been kidnapped and sold by her sister to Lord Berkeley for one hundred guineas. 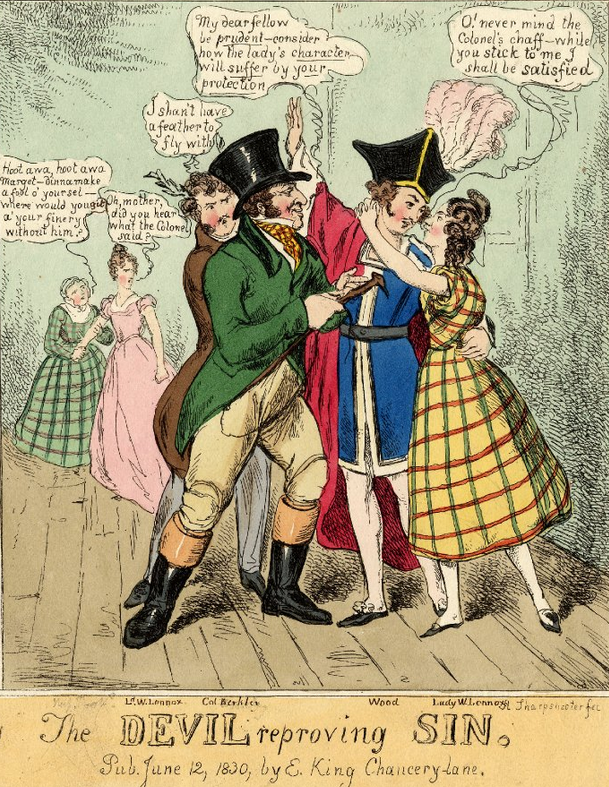 This lead to a scandalous cause célèbre in 1811 when the validity of their 'first marriage' was put to the test. The Bunns' union was a lacklustre arrangement, perhaps not least because 'when poverty comes through the door, love flies out of the window'. It wasn't long before Margaret Bunn joined the Colonel's gallery of conquests. He had figured in many a lawsuit for crim. con. and was the subject of a raft of scurrilous cartoons, but it seems that Alfred Bunn was happily complicit in the affair which retrieved him from debt. The Duke of Wellington's friend, Mrs Arbuthnot, dismisses Berkeley as ‘a vulgar, narrow-minded man, for his great pleasure seems to be to act the sort of King of Cheltenham, where all the vulgar misses make a great piece of work with him’. Colonel Berkeley enjoyed the favours of the ardent tragedienne for a good many years and must have nursed a genuine fondness for her since, upon his death in 1857, he left her £1,000 and £700 a year for life. She lived at Berkeley Castle and toured the provinces with him, including Worthing, the real Sanditon of Jane Austen's unfinished novel, playing largely to packed houses. A widow of twenty-two years, Margaret Agnes Bunn died at Blue Earth City, Minnesota, in January 1882, aged 83, where she had joined her two daughters whose emigration she had financed. From baker's daughter to Mrs Bunn nowhere near suggests her intense and colourful life which earned her the epithet 'the Melpomene of the Caledonian stage'. Grateful thanks to Madame Gilflurt for an invitation to her illustrious salon! Rosy Cole was born and educated in the Shires of England. Her 'writing career' started in her teens. Four apprentice works led to publication of two novels in the 1980s. Life intervened, but she returned to authorship in 2004. She has worked as a Press Officer and Publisher's Reader and is a member of the Society of Authors. Rosy's first book of poetry, THE TWAIN, Poems of Earth and Ether, was published in April 2012, National Poetry Month, and two other collections are in preparation. As well as the First and Second Books in the Berkeley Series, she has written several other historical titles and one of literary fiction under the pseudonym, Marion Grace. She is currently working on the Third Book in the Berkeley Series. All her books are now published under the New Eve imprint. Rosy lives in West Sussex with her son, Chris, and her Springador, Jack, who keeps a firm paw on the work-and-walkies schedule! Written content of this post copyright © Rosy Cole, 2016. I am honoured by Madame's hospitality today. The pleasure of being entertained in her distinguished salon has quite made me giddy! Many thanks for the invitation and may this venue and Madame's ventures thrive! Readers, should you visit my website, you might like a Free Download of The Wolf and The Lamb, First Book in the Berkeley Series. Please click in the column on the left where you see the sign. Enjoy! Merci, Rosy, for your wonderful tales! Great information. Interesting description of Col. Berkeley as some others described him more as a sportsman. He was said to have intimidated his much younger legitimate brother who really was the earl. Is Ms. Cole related to Mary Cole? One quibble-- it probably needs it be made clear that Byron left England in 1816 . Will go visit the Cole site. Thanks kindly for your comments. And apologies for the delay in responding. Have only just discovered them. As to the Berkeley fiasco, it's a long story, complicated but fascinating on a human, legal, women's and social history level, and for the way it intertwines with the major events of its day, the 5th Earl of Berkeley having been very close to Prinny. No, I'm not related to Mary Cole, but do think it's a bit spooky that my full name now incorporates hers which it didn't when I set out to research her story way back! Very good piece. However, Margaret Bunn died 12 December 1882. I suspect the time corresponding between her estate and Colonel Berkeley's lawyers (her eldest daughter's family has the original letter) stopping her yearly stipend is the cause of the January/February 1883 dates British sources give. (I'm her 3rd great granddaughter).